Medical reports have shown that nearly 50% of fertilized oocytes end due to spontaneous abortion, and most of them most occur before or at the next expected menses time. And nearly 15% of clinically recognized pregnancies result in miscarriage. ‘Recurrent Miscarriage’ means three or more spontaneous pregnancy losses in the first trimester. But, there are few things that are more heartbreaking compared to the miscarriage. For a large number of couples, when the test is positive the few-day-old embryo is a person, and when the pregnancy fails, the loss is very real. With every 25% of recognized pregnancies losses, an isolated miscarriage is very common, so it is clear that many women experience a loss within the reproductive years. And less than 5% of women experience two consecutive miscarriages and it is less than 1% for who experience multiple miscarriages (three or more). A couple who has experienced recurrent miscarriages may benefit from a thorough medical evaluation. Below mentioned are the causes and their treatments. .
1. Genetic – (I) It has been reported that 60% or more of miscarriages happen due to a random (by chance) chromosomal abnormality like a missing or duplicated chromosome in the fetus. The placental tissue can be obtained at the time of a miscarriage to test for abnormalities. Treatment – Unfortunately these problems are ‘accidents of nature’ and cannot be corrected as they occur when the cells of an egg or sperm divide. In the future, some hereditary tendency for abnormal cell division may come. (II) Also problem occurs when one of the parents passes an unusual amount of genetic material to the embryo – a chromosome analysis is performed on the blood of the parents’ that can identify this inherited genetic cause. Actually, unbalanced translocation is the most common inherited abnormality in this case. Treatment – To treat this, a couple may consider IVR (In-Vitro Fertilization). The embryos obtained by IVF are tested through PGD (pre-implantation genetic diagnosis) and only normal embryos are selected for transfer. For a woman of over 40, usually one-third of all pregnancies end in a loss. It has been found that the majority of the embryos lost, have an unusual amount of chromosomes. And age is a very important factor that a woman is born with her eggs stored already in her ovaries. So, the eggs are subject to all the wear and tear occurs in 40+ years. Treatment – Recently, some dramatic advances have been seen in the technology of freezing ova (eggs). This may soon be available widely for all the women who want to put off childbearing until their mid-life. Another alternative is ‘egg donation’ that is already widely used. The risk of miscarriage linked to a donated egg relates to the age of the egg donor and not the receiver. Many evidences suggest that the abnormal integrity of sperm DNA may affect the development of embryo and possibly increase the miscarriage risk. Some medications like ‘Sulfasalazine’ are very toxic for the male reproductive tract and causes fragmentation in their sperm’s chromosomes. Treatment – The tests pioneered by ‘Repromedix’ can detect the levels of DNA fragmentation; the levels higher than 30% are linked to less than 1% chance of the female partner with a pregnancy to term. The couples who have experienced two miscarriages or more may benefit from counseling. You may also refer to a new program known as ‘Pregnancy Miracle, created by Dr. Lisa Olson. The program describes many ways to prevent miscarriages. The creator of this pregnancy guide herself remained a victim of infertility for 14 years. She could not feel the joy of motherhood. Later, she discovered some new secret tips and techniques that helped her get pregnant twice at the age of 43. Now, all those newly found information has been comprised in this book. The book helps you get pregnant in just two months. This guide tells you only natural ways to get pregnant, no drugs involved. Check out our holistic guide with natural solution of recurrent miscarriage cure. 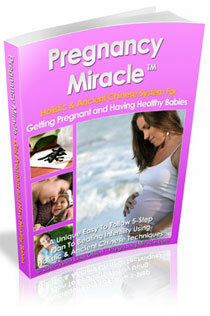 A certified and successfully used by many to get pregnant in 1 or 2 months naturally in any age. No need of surgery or drugs. Pregnancy should be a natural process to get healthy baby.